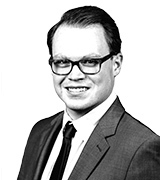 på November 23, 2015, 11 a.m. When Angela Merkel became Chancellor of Germany in 2005, Tony Blair was still Prime Minister of the UK. Now, with Angela Merkel still the head of Germany’s government in 2015, David Cameron lives at Downing Street. Last weekend, it was exactly 10 years since she was sworn into office. For a long time few in Germany could imagine her chancellorship ending, but this is now beginning to change. Not everyone in Germany has approved of her approach to the refugee crisis, and government approval is at a three-year low. New YouGov research reveals that fewer and fewer people would like another ten years of Merkel as chancellor, while more and more think that her reign will be over after the next federal election in 2017 – even voters of her own party. Overall 30% of respondents would support another 10 years of Merkel as chancellor while 59% would oppose it. In March, when the question was last asked, 42% would have liked Merkel to celebrate her 20th anniversary as head of government in 2025, and 45% would not have. Of the supporters of the CDU and CSU, the two parties that form her faction in the Bundestag, just over half (56%) would like to have her as chancellor for another 10 years. In March, this number was 73%. Merkel hasn’t even announced officially if she will run again in the autumn of 2017. But although many seem sure that she will, it's another question if she’d actually win. While in March the majority (53%) of SPD voters – Germany’s second largest party, which is in a coalition with Merkel’s CDU/CSU at the moment – thought it likely she’d be chancellor after 2017, now only 45% do. Overall, 42% of Germans expect her to remain chancellor after 2017, down from 56% in March. 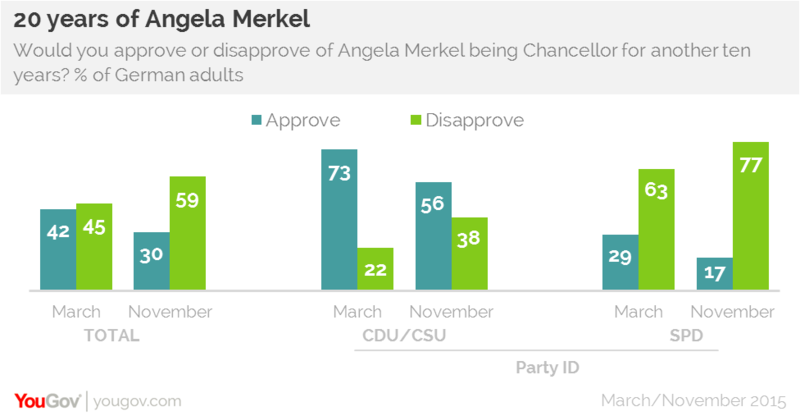 Angela Merkel may not be as popular as she was a few months ago, but she still does quite well. Her party is leading the polls by a wide margin and her personal approval rating (-21) is still significantly better than the overall approval rating of her government (-51). Moreover, she is still the reigning “most admired woman” of Germany.